Hi everyone! This weekend D and I had a garage sale…finally. We’ve been gathering stuff to sell for a few months, and it really did force me to evaluate what things I needed and what things I needed to get rid of. We went room by room and got rid of stuff we still had from our apartment days, plus we also got rid of some furniture that just didn’t fit in with our overall home aesthetic. I think sometimes as a DIY/decor blogger, I have a tendency to hoard things like decor, craft supplies, etc. because I may need it or I may be able to repurpose it. I also feel the need to be on “trend” and not use stuff over and over, but I think readers know that I’m not Pottery Barn and don’t have access to never ending amounts of home accessories. Honestly, it felt SO GOOD to get rid of so much. We ended up making over $550 for our Cancun fund in just three hours, so I’d say it was a success. Deep down I know that all that stuff likely cost over $550, so it really forced me to make a change from here on out. Yesterday D went to a craft beer meet-up, and I drove around Corpus and went to my usual stores: World Market, Target, Home Goods, Kirklands and Marshall’s. I saw plenty of stuff I liked, but before buying it I stopped to ask myself if it’d be something that would likely end up in a garage sale next year or the year after. Was it something I’d love in five years? Was I only buying it because it was cheap…as was the case at Kirklands when I found a candleholder that was $8.97 plus an additional 40% off. I’ll admit I walked around the store for a good 20 minutes before I finally put the item back in the clearance section and walked out. Maybe a good term would be that I am trying to practice mindful shopping. Plus, if you asked me if I’d prefer to buy 20 clearance items worth $200 or use that $200 towards a vacation experience, I’d always choose the vacation. But, at World Market I fell in love with a side table I had seen online and couldn’t live without. 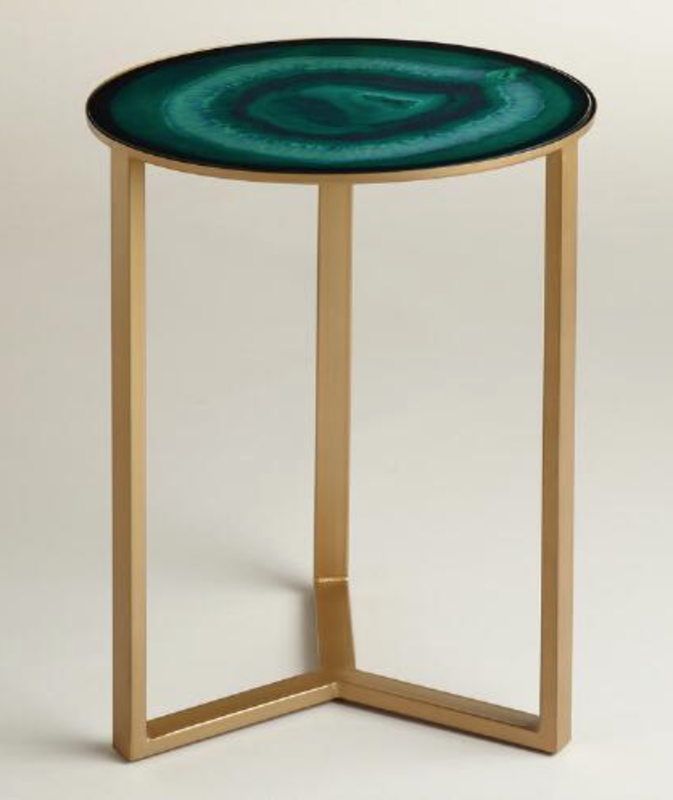 I saw the Emerald Harbin Accent Table online the night before and could picture myself loving it in 10 years. Agate will always be something I love, much like my affinity for damask and sparkles. So, it came home with me for the grand total of $46, which is a bargain. It was half off, plus I had an extra 15% off coupon. I posted about it on Instagram last night (see below). 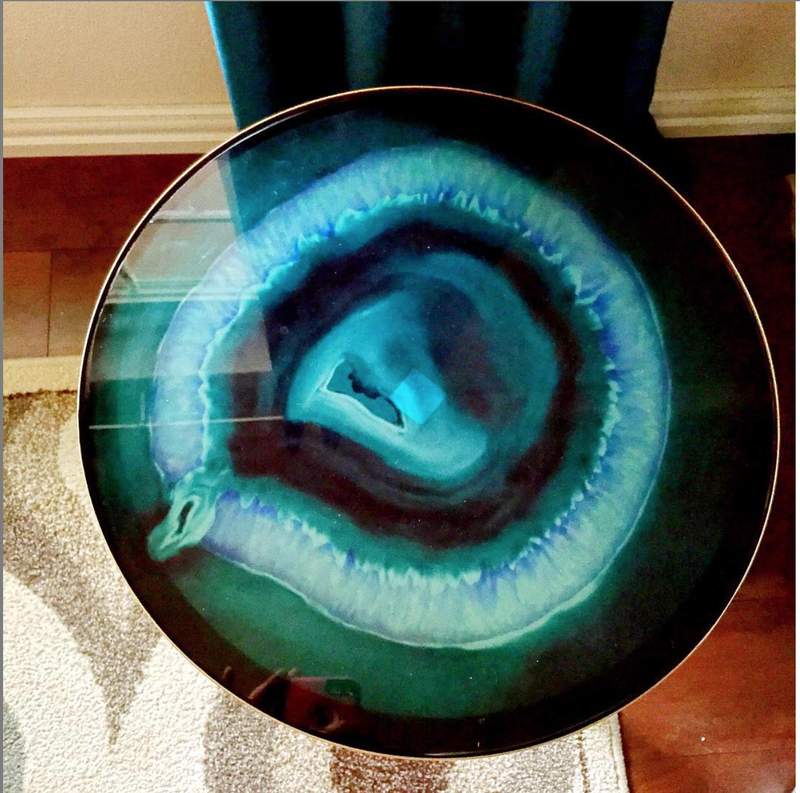 You guys, I can’t even explain in words how GORGEOUS this table is. The glass is thick, luxe and has a richness and depth in the colors that makes it a showstopper. The gold is matte and not overly showy. I can’t wait to style this with a simple floral arrangement or candles. I wanted to buy one in each of the colors, but I settled on this emerald/teal one that really pops. My second fave color is the pink (amethyst) one. I’m giving my dining room a tiny facelift, and this side table is perfection. I’ve lived with VBB (very boring beige/Sahara Desert Sand) in the dining room for 4.5 years, and I want to re-paint the dining room a sultry charcoal color in time for fall decor. 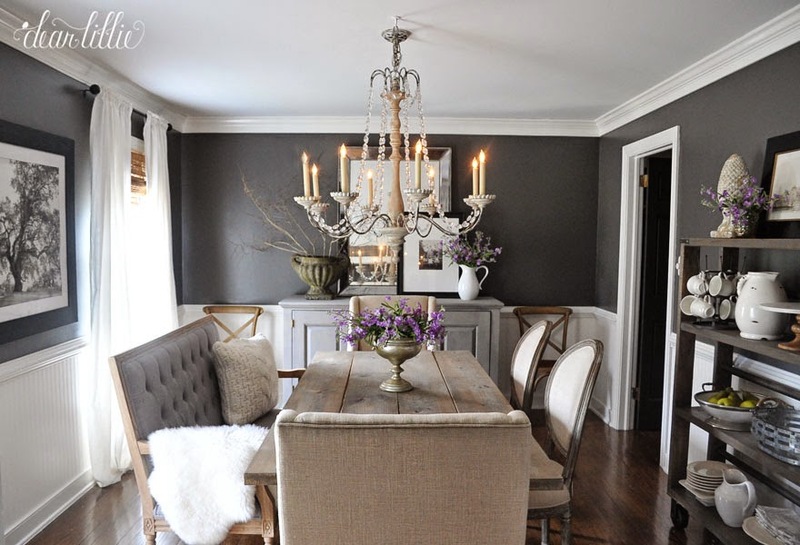 I’m leaning towards Kendall Charcoal by Benjamin Moore after seeing it in Dear Lillie’s dining room. I’ll never completely stop buying stuff for the house, because let’s face it, I’m a decor/DIY blogger and love it, but I am trying to be more selective and mindful of what I spend invest my money on. I’d rather have quality over quantity. One thing in, one thing out. Any of you trying to spend less, have less and live more? Got any tips for me? That's an excellent idea! I never carry cash around, but that would definitely help curb impulse purchases. We don't carry any credit card debt, but I still want to spend money more wisely. Great tip! That is a beautiful little side table! Yard sales can be great & you really benefited. Our neighborhood doesn't allow them & I really don't have the patience anyway. We are really great about donating our used goods though. My ways of spending less is to always pay cash for everything. I've done it for years. If I can't pay for anything in cash, I won't buy it. I have no credit card debt. It's really a less stressful way of living, especially with excellent credit. Amen, I am on the same wave length. I just went through my fabric stash and got rid of some things that have no value at all and were way old, then found some to make some pillows with and giveaway the other. LOVE that table. It is fabulous.